Monarch Air Group provides private air charter in Alexandria, VA. Our clients benefit from top-notch service, unrelenting dedication to safety, wide selection of aircraft, and years of experience in chartering private jets. To obtain a free quote, please use our online quoting tool provided below, or call toll free 1-877-281-3051. 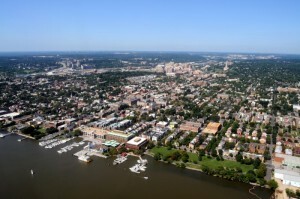 Monarch Air Group provides private jet charter flights in and out of Alexandria, Virginia, USA. Located in Northern Virginia, on the western bank of the Potomac River Alexandria is a city, which is situated 9 miles south of Washington, D.C. It is home to offices of many government agencies, such as the Department of Commerce, Department of Defense and the U.S. Patent and Trademark Office. The city was founded in 1749, and played an important role in the history of the United States. Alexandria has historical and cultural heritage that reflect the American past. Old Town in Alexandria boasts old brick-paved streets with homes and buildings dating from the 18-th to the 19-th century, luxurious restaurants wonderful shops, and specialty retailer. The most popular attractions are the Black History Museum, Torpedo Factory Art Center, the George Washington Masonic National Memorial, the Lee-Fendall House, the Christ Church, the Carlyle House Historic Park, and the Lyceum Alexandria History Museum. Nearby cities are Annandale, Arlington, Springfield, Mount Vernon, and Burke. Alexandria is served by Dulles International Airport (IAD) and Ronald Reagan Washington National Airport (DCA).